The team was formed in 1964, after a tragic accident when three scouts died in a blizzard whilst attempting the 4 Inns Walk, a 50 mile hike over some of the Peak District’s most challenging terrain. We had no premises, met in a pub in Buxton and used borrowed equipment to deal with a handful of call-outs a year. 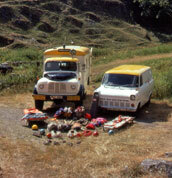 By the early 70s calls had increased and we were offered free use of a garage in a quarry at Dove Holes near Buxton. The garage gave us space to store equipment and a small training room. Under the auspices of St John Ambulance, our first aid training led to improved casualty care, and we purchased a slightly better vehicle for faster responses to call outs. In 1989, ousted from the previous site by redevelopment needs, we acquired a new building in Dove Holes village on land generously leased to us by Doveholes Community Association. With a proper garage and meeting room we were able stretch our wings and began to improve our training and modernise our equipment and rescue techniques. On 14th Jun 1990 HRH the Princess of Wales graciously opened the relocated HQ building. By the early 90s we were dealing with about 40 call-outs per year, and had a growing membership. We began to work more closely with the ambulance service, learned advanced first aid skills, how to administer drugs and medical gasses, and better rope rescue techniques. In 1999, with call-outs around 60 per year and strong support from the police, ambulance service and public, we embarked on an ambitious 3-year modernisation programme. A second building was planned with a larger garage and office space, our two vehicles were replaced, we bought an Incident Control Trailer, and new protective clothing. Our training structure was revised and new standards set, together with methods of measuring achievement. The one thing that has not changed: we are all still volunteers who enjoy what we do and are proud to be a part of the team. In March 2003 HRH Prince Andrew opened the new base extension. The team received The Queen’s Award for Volunteers in the Community presented by Colonel Hilton Lord Lieutenant of Derbyshire. In 2012 Derbyshire Fire and Rescue Service generously allocated us garage space and a meeting room in their new Derbyshire Fire and Rescue Centre to the south of Buxton. This gave us more flexible training space, along with the facility to house a 3rd vehicle so we could give a faster response to calls in the south of our operational area. In 2013 the team became the first Mountain Rescue team to become a Charitable Incorporated Institution, a new legal form made available by the Charities Act 2006. This new status is far more suited to the size of the team and the legal environment under which we operate and should provide a firm basis for the foreseeable future. Today, the team is a highly efficient unit of around 60 members dealing with 80+ calls per year. We can claim to be one of the best-equipped and best trained teams in the country. The one thing that has not changed: we are all still volunteers who enjoy what we do and are proud to be a part of the team. Want to read a fuller version?